A team from the Indian Institute of Science and the Karnataka government has been invited by the Russian Academy of Sciences to explore the possibility of a supercomputing centre in Bangalore. A team from the Indian Institute of Science and the Karnataka government has been invited by the Russian Academy of Sciences to explore the possibility of a supercomputing centre in Bangalore, the paper said. 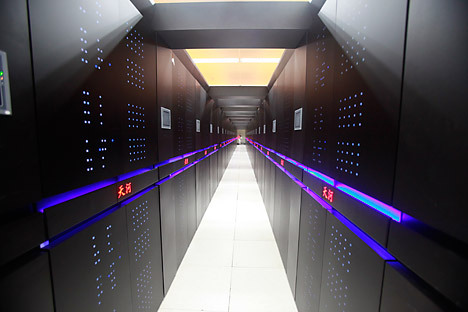 The Tianhe-2 is a 33.86 petaflops supercomputer located in Sun Yat-sen University, Guangzhou, China. It was developed by a team of 1300 scientists and engineers and is the world's fastest supercomputer according to the TOP500 list for June and November 2013. India's supercomputer Param Yuva - II is ranked at 83 while Russia's Lomonosov supercomputer is ranked at 37, according to the ET report. A viable joint cooperation between Russia and India could result in a computing system as big as a basketball court that can perform about as many operations per second as several million personal computers, the paper added. CNR Rao, who heads the scientific advisory council to the Indian prime minister, told the paper that it was difficult to assess a potential collaboration right away. India and Russia have signed several memorandums of understanding on scientific cooperation, which call for joint research and academic exchanges. There is also a joint research project funded by the Russian Ministry of Education and the Indian Government’s Department of Science & Technology.